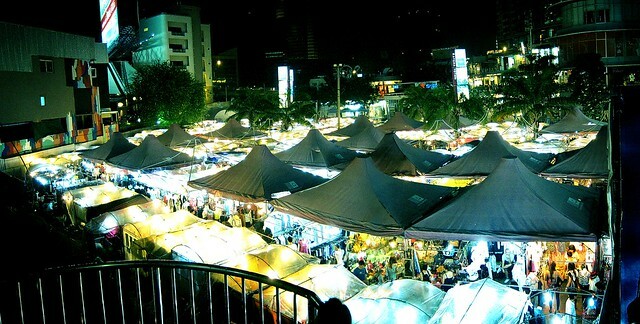 The Ratchayothin nightmarket is more popular among Thais than the Lumphini nightmarket, where you can mostly find the typical tourist souvenirs and so on that you can find pretty much at any tourist hotspot in Thailand. The Lumphini night market is still great for people who have not traveled extensively throughout Thailand, but for the old-timers who would like to venture a bit more off the beaten tourist path, the Ratchayothin night market is much more promising. The night market at Ratchayothin is particularly popular among Thai teenagers to buy cheap fashion accessories, fake brand bags, watches and clothing – and (of course) lots of snacks. It is located right next to the Major cinema complex, so they like to mingle around here before or after they watch a movie. It is just opposite the Elephant Building. For a good Bangkok shopping and sightseeing experience, it’s interesting – although sometimes Europeans and Americans who visit these kinds of markets find them kind of overwhelming, and they often do not find the things that they are looking for here, because the merchandise here is typically tailored to Thai taste. It’s also known as Major Ratchayothin flea market, and if you want it crowded with lots of stalls, the best time to go is Friday and Saturday night, but anything between around 5pm to 11pm from Thursday to Sunday you will find it busy there too. Have a question about sightseeing in Bangkok? Just contact me and ask away, I love helping people have a great time here.